A tangy blend of tomato, sweet basil & green tea. This Tomato Basil Sipping Broth is a tangy blend of tomato, sweet basil & green tea. This first-of-its-kind savory single serve hot beverage delivers an amazing taste using the highest quality vegan, natural, wild harvest, organic and gluten-free ingredients. It really is Comfort Food in a Broth™. Millie's Vegetable Sipping Broth is a single serving Steepable™ that was created by a school teacher who needed a snack between classes and flavors inspired by her mom Millie. 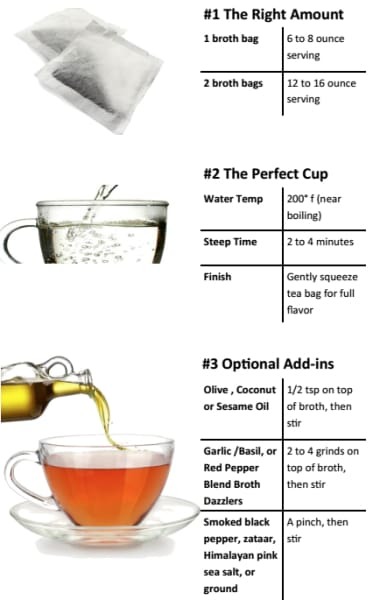 This first-of-its-kind savory hot beverage delivers an amazing taste using the highest quality vegan, natural, wild harvest, organic and gluten-free ingredients. It really is Comfort Food in a Broth™. Nutrition Facts: Serv. Size: 1 packet Amount Per Serving: Calories 15, Fat Cal 0 Total Fat 0g (0% DV), Sat Fat .0g (0%DV), Trans Fat 0g ,Cholest. 0mg (0%DV), Sodium 260mg (11%DV)Total Carb. 0g (0%DV), Fiber 0g (0%DV), Sugars 0g (0%DV), Protein 0g (0%V), Vitamin A (0%DV), Vitamin C (0%DV) Calcium (0%DV), Iron (0%DV) Percent Daily Values (DV) are based on a 2,000 calorie diet.